I want to touch on this subject, to help those who pull from shelters and pounds, and those who adopt from them. 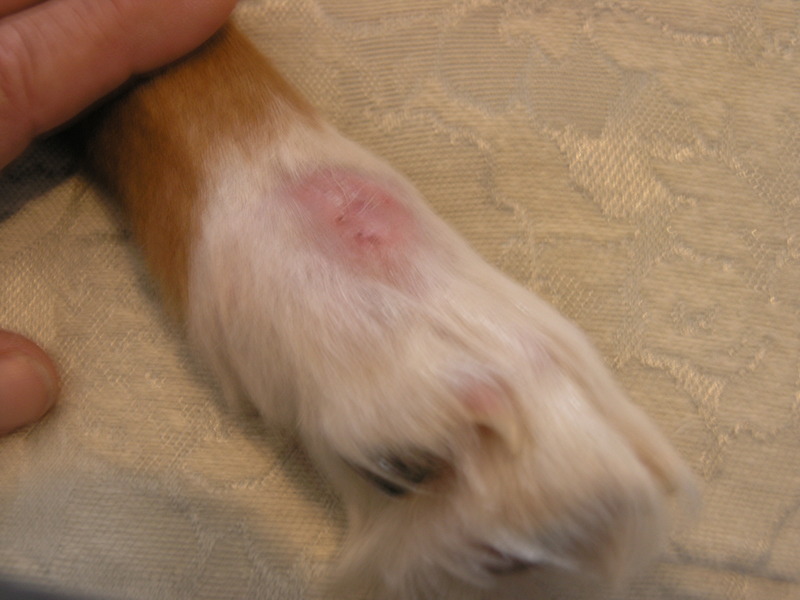 Many times, dogs have injuries, hot spots or sores throughout their body. Sometimes that is a result from a food allergy, or a flea bite. Sometimes these injuries were created by their handler. I have reviewed the paperwork of hundreds of dogs from dozens of shelters, and once and a while they will comment about hair loss on the paw. Understand that mange usually presents around the eyes, and on the face. Hot spots are rarely on the top of a paw. A crate sore is created when a human pulls a dog out of crate too quickly, the dog is scared, and slams on his brakes! The dog applies all of his weight to his rear to prevent leaving the crate, and while the human continues to drag him out, the dog’s front paws get stuck under the bar of the crate. If enough pressure is applied, this can seriously damage the paws, and sometimes result in a break of the bone. When humans lift a dog from a wire crate, and do not lift the dog high enough, sometimes the back paws get stuck, resulting in the same injury. This is very common in pups. Recently Polly Pocket came to us with one severe crate sore on her hind leg, and she was shy fearful. Goldie Hawn had crate sores on all of her paws, she was emaciated, and not socialized. This type of sore does not necessarily need medication unless it’s infected, it present severe hair loss, and will clear up on its own, however, it could create a very shy and fearful dog. The dog may be afraid of entering a crate, and the dog should be treated with patience, and motivated (maybe with treats) to over come their fear of the crate. Please be aware of this when cruising the shelters and pounds, and know that a dog with crate sores may have been handled by someone with a heavy hand, or by someone in a hurry. They are worth saving, rescuing or adopting, but at least you’ll understand why a crate by present fear. Before I walk you through the difference between shelters, pounds, rescuers, and breeders, there’s one very important thing I must share. We all know that the average person hates—actually loathes visiting a pound or shelter. Let’s face it, most shelters are depressing, they smell, they are under-staffed, and most of the volunteers and employees aren’t very helpful. Today you can search Google for shelters and pounds near your area, or search on various pet rescue sites, and literally read all about the dogs that are currently up for adoption near you. However, I would personally prefer adopting a dog that’s been living at a foster home. The dog itself may have very little history, if any at all, but while the dog has been with a foster, I can be told proof positive if the dog is aggressive or friendly, shy or hyper-active, housebroken or not! It’s really important to me, before I place a dog in a home with other dogs or children, that the dog has been carefully evaluated for several days, sometimes weeks before the dog is adopted. PLEASE DO NOT FEEL THAT THERE AREN’T ANY CUTE OR PUREBRED DOGS IN SHELTERS AND POUNDS. Take a look at my rescued dogs, some rescued from high-kill shelters. 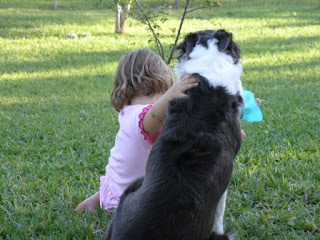 Every time a child is hurt by a family dog, I experience an overwhelming feeling of despair and sorrow. We invite dogs in our homes in hopes that they will provide us with companionship and protect us. Regardless of whether you are bringing home a puppy, or an adult dog, there are always risks. Usually signs of dog-aggression and dominance take months to surface. Gone are the days where a family can make sound decisions with regard to breed. Today, it seems that all breeds, even the ones that are known for being great with kids can bite. Families that are faced with the decision to surrender their pet do so by either opting for euthanasia, surrendering the dog to a local shelter, pound, or a rescuer. Are there steps that your family can take to ensure that the dog you bring home will be safe with your children? Of course there are. The most important rule of thumb, is beware of what you read on the internet. There are thousands of breed descriptions that indicate “good with children” or “great family dog”, but this not necessarily the case. Is where your dog comes from important? Absolutely! If you think that buying a young puppy is safer than adopting an older dog, think again. Just because the puppy will live with you, be trained by you, and cared for by you, that doesn’t mean it won’t bite your children. Inexperienced breeders and puppies born from puppy mills are not breed for temperament, but sometimes breed for greed. Experienced and reputable breeders, however, carefully breed with temperament , is if you can’t return the dog, there’s a reason. What does this mean? An experienced breeder will not breed a male and female with bad characteristics, especially temperament. First, you should physically visit the premises where you are going to purchase your puppy. Ask yourself if the home appears to be a loving and healthy environment. Ask yourself if the parents of your puppy are healthy, if they are showing signs of dominance or aggression. See for yourself if the litter of puppies have been with the mother consistently. One of the main reasons for dangerous dominance and aggression is not only the temper-ament of the breed and the dog’s parents, but also the way the puppy has been reared. Puppies that do not have enough time to be with their mother, and with their litter mates do not get the chance to learn puppy pack manners taught by the mother. If your puppy has been living with its litter mates and its mother for at least eight weeks, chances are you will have increased your chances for a well-rounded dog. Never purchase a dog sight unseen, from the internet, from a pet store, or any other source where you can not personally inspect its current living conditions. Ask yourself, if there is no accountability on the part of the seller, don’t buy it. What I mean by that. A reputable breeder or respected rescue will always keep tabs on your progress, and will work with you if things go wrong. Why? Because they truly care about their dogs. Buying a dog sight unseen also opens the door for enormous medical bills. Dogs born in unhealthy environments, and breed for the wrong reasons may have kennel cough, parvo virus, heart worms, and worst of all, may develop serious genetic issues as they get older. The origin of your puppy or dog is truly very important. If you see an ad “free to a good home” be careful. There is no way for you to know if this dog is being “given” away because it’s a biter or is seriously ill. If a person knowingly and willingly gives a dog away that is a known biter, they are liable. In most cases, it can take a dog months before they start showing acts of violence. Second, if you are hoping to rescue a dog from a reputable rescue organization, find a rescue that uses foster homes. Your dog’s foster family will be able to give you details about the dog, and you win by bringing home a dog that has already been kid-tested and approved! Third, upon bringing your new friend home, plan on attending obedience classes. Obedience classes will increase your chances of having a well-mannered dog. Studies show that dogs who have attended some sort of dog training classes are least likely to find themselves at a shelter or pound. If you’re not sure which dog is right for you, visit local dog parks and talk to the locals! Volunteer at a shelter or rescue and ask questions. If you’re still not sure, volunteer to foster a dog before you make your final decision. Reputable Breeders show their dogs. They belong to breed-specific organizations. Their dogs have won titles, won in breed-specific contests. Because reputable Breeders’ dogs are considered the epitome of the breed’s standards, their pups are very valuable. Just because a dog has papers that labels the dog as a pure breed, it doesn’t mean that he truly is. Many puppy mills create their own “registration company” and will give you phony papers that are worthless. Oh sure, they are registered, but they are registered with the puppy mill operator’s own company. Important Notice: Just because your dog may have papers that are not recognized by any of the major AKC-recognized organizations, it does not mean that your dog is less beautiful, less loving, less obedient, or less deserving of your love and attention! The purpose of this page is to allow you to be aware that you may be spending quite a bit of money for a dog that you think is a champion, when instead, the dog you are buying may produce evidence of genetic disorders as your dog becomes older. Research the name of the breeder and the name of their company on the internet. Visit the premises in PERSON. There is a fine line between a hobby breeder, and a puppy miller. Because of the internet, a well-designed website could easily fool you into believing you are purchasing a pup from a quality breeder. The bottom line is, never purchase a pup without visiting the premises, meeting the breeders, and their dogs. Insist on seeing the medical records and proof of vaccinations on the parents. Inspect the facility yourself. If they are reputable breeders, they will be glad that you care enough about the dog to ask. Also, if a breeder does not conduct a background check on you, your property, ask questions about your family, your home, and your lifestyle, they are not a reputable breeder. If you are purchasing a pup from a reputable breeder, prepare to be scrutinized as much, if not more, than you would be by a reputable shelter, pound, or rescuer. If you do purchase a dog online or sign-unseen, be prepared to spend a big chunk of change on vetting costs. Purchasing a pup from a pet store is the same as purchasing a pup without verifying that the pup did not come from a puppy mill. Some people who breed their dogs hate to be called Backyard Breeders. The name itself has a negative connotation. Just as the word Rescue has recently had a negative association with it. Instead, backyard breeders want to be referred to as families with dogs. Many believe that backyard breeders promote the puppy mill industry. If you have had one accident with your male and female, and have only had one litter, and then spayed and neutered to ensure that your dogs will never breed again, (in my opinion) no one should judge you for your actions. However, if you are having multiple litters per year, you are either producing dogs for the puppy mill industry, or simply selling your pups for a profit and promoting our current animal overpopulation. For every unwanted puppy that is born, one dog killed at a shelter. Most backyard or irresponsible breeders do not have enough buyers for their entire litter—responsible breeders do. I responsible breeder will never surrender their unwanted pups to a shelter, pound, or rescue, nor will they sell them to a pet store. The caveat here lies in the hobby breeder that is serious and dedicated to the breed. I support these breeders 100%, but they are very hard to distinguish in person, and impossible to distinguish online. If we wiped out breeding all together, who would be continuously trying to protect our favorite breeds? This reminds me recently, when I was emailing another well-known rescuer, who responded to me by writing, “I don’t even know who you are. Why haven’t I ever heard of you before? How do I know you are truly a rescue?” My answer was, “You have never heard of me because I’m new, just as I’m sure you once were new.” Of course, I had to be me, and advise her that “rescue” is a verb, not a noun. When I meet and talk with breeders, I always have to remind myself, that no matter how much I do not believe that now is the time for anyone to breed, the breeder standing in front of me may one day be a Westminster winner, Best in Show even. Why would any of us want to stop that? If the puppy mill industry would vanish, couldn’t we then go back in time and breed our dogs that we absolutely adore, without having a guilty conscience? Times have changed, and we can’t turn the clock back. If you’re in your mid-forties, you’ll remember the days when all we had was the local dog catcher and the city pound. There were no such things as shelters and rescues. Remember those days? So what’s wrong with having too many dogs out there? Maybe that doesn’t bother you. Maybe you don’t realize how many dogs are being euthanized every year (millions) and maybe you don’t realize that many are still be gassed and gassing shelters or what’s called “the kill box”. Maybe you would care if you knew how much it cost tax payers to catch, feed, vet, and then kill these dogs each year. If you only knew how much money could be saved by instilling a low-cost spay & neuter program. For more information an innovative ways to bring attention to the plight of the puppy mills, visit http://www.puppymilltruck.com or search the internet for detailed and graphic information. It’s just about impossible for me to tell the difference at first glance. Let’s face it, some people are doing it right, and some people are doing it only for money. Don’t get me wrong, reputable breeders make good money when they well their prize pups, but after all, they are PRIZE pups! Even reputable breeders, whose dogs have been certified can have pups with genetic disorders, but the chances are very slim. A puppy mill, or inexperienced breeder, however, has an extremely high chance of passing on genetic disorders. What I fear the most is when inexperienced or non-caring people breed dogs that have bad temperaments—Those are the dogs that are cute when they are puppy, but they grow up and become dogs, they bite. A reputable breeder will never breed a dog that has a bad temperament.